A level of safety that is built in, not bolted on. Both your life and the lives of your patients depend on the safety and performance of your barrier isolator. Each ChemoSHIELD® barrier isolator is made to order with details like seamless covered corners and single sheet construction to ensure a level of safety that is unparalleled in the industry. The ChemoSHIELD® offers a contained, leak-tight negative pressure work area suitable for hazardous pharmaceutical compounds, chemotherapy agents or IV admixtures that can be harmful to pharmacy personnel. 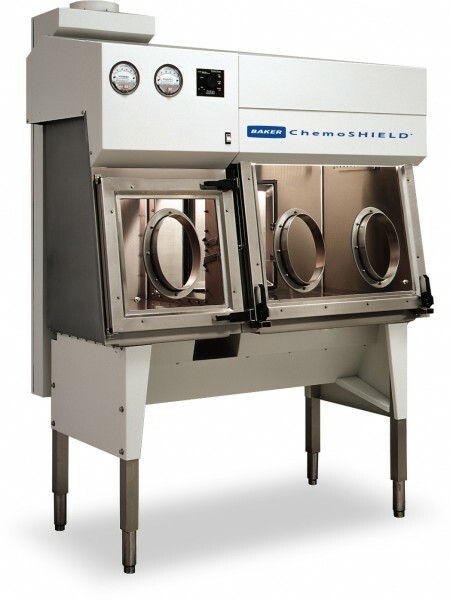 ChemoSHIELD® creates a unidirectional HEPA-filtered airflow of better than ISO Class 5 (Class 100) air cleanliness conditions within the negative pressure chamber to prevent migration of hazardous contaminants to the outside and to minimize cross-contamination in the direct compounding area. Our clean technology design improves the pharmaceutical compounding process by offering the finest environmental protection in the pharmacy laboratory. As one of the most comfortable isolators in the industry, the ChemoSHIELD® features a slanted viewscreen with a top hinge that allows for full opening for loading and unloading of pharmacy instrumentation or equipment. Oval gloveports offer easy reach to interior surfaces for users of different heights, and multiple positions allow total access to the interior. There is also a spacious, negative pressure interchange (pass-thru chamber) which allows clean and easy transfer of materials into or out of the chamber. An adjustable stand allows the cabinet to be configured for standing or seated operation.